More than a dozen infants at a Santa Monica day care center are being quarantined after a baby was confirmed to have contracted measles, the latest case in a growing outbreak of the once-eradicated disease. As of Monday, according to the California Department of Public Health, there were 92 confirmed cases in California, including 28 in Orange County, 21 in Los Angeles County and 13 in San Diego County. Most of the cases have been linked to the outbreak at Disneyland in December, and most of the victims had not been vaccinated. President Obama joined doctors and public health officials in urging Americans to vaccinate their children. 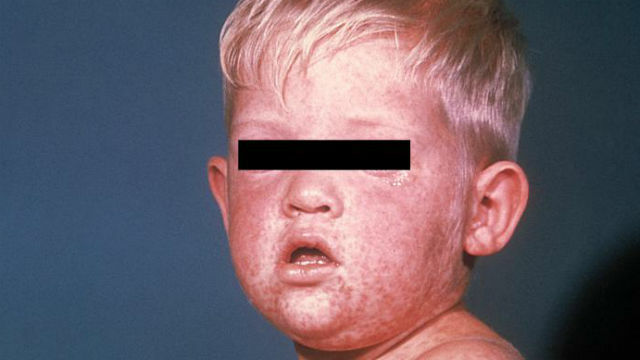 According to the Centers for Disease Control, measles can be deadly. One out of every 20 children with measles gets pneumonia, and one child out of every 1,000 who get measles will develop encephalitis that can lead to convulsions and can leave the child deaf or mentally retarded. For every 1,000 children who get measles, one or two will die from it. The Santa Monica baby, who is under 12 months old and too young to be vaccinated, is enrolled at the Santa Monica High School Infant Toddler Center, which serves school staff, community members and three teen parents who attend the high school, said Gail Pinsker, the community and public relations officer of the Santa Monica-Malibu Unified School District. The west side of Los Angeles has been identified as a area where wealthy parents are less likely to vaccinate their children. Opposition to vaccination stems from a British medical study in 1998 that later was discovered to be fraudulent. Pinsker said 14 infants exposed to the baby will be quarantined for 21 days. The day care’s infant room will be closed until further notice, and the toddler room will be closed through Thursday, she said. The high school remains open. “The baby was contagious while in the child care center before a fever broke and a rash started and a parent was concerned,” Pinsker said. A letter about the measles case was sent to parents of children enrolled in the day care this weekend, Pinsker said. The center serves 24 families with children from 6 weeks to 3 years old, she said. A “contact investigation” to determine whether if there “are additional concern or exposure” at Santa Monica High School beyond the infant toddler center is being conducted under the Los Angeles County Department of Public Health, Pinsker said. A baseball coach at Santa Monica High School came down with measles about a week and a half ago, health officials said. Pinsker said she was not sure where the baby contacted the measles, but it was likely not connected with the baseball coach.